SETS AVAILABLE, AS WELL AS DIFFERENT PEARL AND RHINESTONE COLOUR COMBINATIONS. PLEASE CHOOSE FROM THE DROP DOWN MENU WHEN ORDERING. 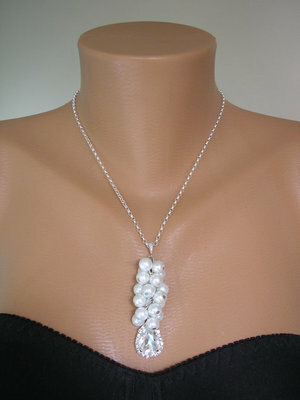 Beautiful handmade glass simulated pearl and rhinestone cluster pendant necklace. 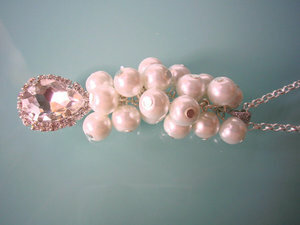 This pendant necklace has been made from high quality snow white glass simulated pearls, which hang in a cluster. From the pearl cluster hangs a gorgeous clear faceted glass teardrop rhinestone in a silver tone halo bezel setting. The pendant is strung on a STERLING silver belcher chain. The chain is secured by a lobster clasp. 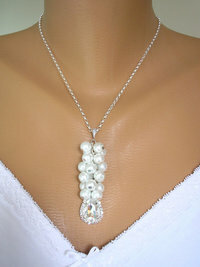 This pendant comes in various lengths, pearl colours and rhinestone colours. Please choose from the dropdown menus when ordering. PLEASE NOTE - If there is a pearl or rhinestone colour combination that you would like, but can't see in the drop down menu, please contact me via Etsy's convo system. 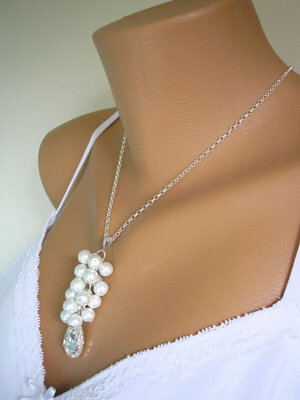 Perfect for the bride, bridesmaids or mothers of the bride and groom!